Editor's note: This is the first in a series of features highlighting how federal funding has advanced important discoveries. It's only 60-year-old medical knowledge, but the ability to transfer healthy bone marrow—essentially an immune system—into a sick patient has saved tens of thousands of lives. Discovering the basics of bone marrow transplants, as well as how to prevent complications such as graft-versus-host disease, has required hundreds of studies and experiments. As research physicians piece together a complicated puzzle of transplant success, new discoveries advance the field every year. Behind this advance has been a steady flow of federal dollars from the National Cancer Institute, the National Heart, Lung, and Blood Institute, and even the Department of Defense (which hopes to find treatments for certain cancers affecting service men and women). Grants from federal institutes have allowed researchers and physicians to hone their knowledge and give patients a better chance of survival. "There is no way that transplantation would be where is today if it weren't for federal funding," says Fred Appelbaum, executive vice president and deputy director at Fred Hutchinson Cancer Research Center in Seattle. "No drug company has a vested interest in it; there's no product. It's solely because of federal funding that research has gotten to where it is." Bone marrow—the spongy tissue inside of bones—is essential for the production of several short-lived blood cells, including red cells which carry oxygen to muscles, white cells that are critical for fighting infection, and platelets that help blood to clot. All of these cells are formed by marrow's hematopoietic (blood-making) stem cells, which have the capacity to replenish the whole hematopoietic system. "These cells have remarkable regenerative capacity," Appelbaum says. They play a major role in researchers' quest to figure out how to heal sick patients from the inside. During the mid-20th century, researchers were learning much about marrow. If bone marrow is destroyed—through high doses of radiation, for instance, it stops producing these blood cells and the person dies. That's precisely what happened in the atomic bombings of Hiroshima and Nagasaki, when many people died because of high radiation exposure. Shortly after the World War II atomic blast, medical scientist Leon Jacobson used mice to show that if you shielded the bone marrow in one limb of an irradiated mouse, the mouse would survive. In addition, if you took marrow from a non-irradiated mouse and infused it into an irradiated mouse, the exposed mouse could recover. E. Donnall Thomas, who is now known as the "father of bone marrow transplantation," speculated that it just might work in humans, too. He reasoned that if you destroy abnormal bone marrow—affected by leukemia or a sickle cell disease, for instance—and replaced it with healthy marrow from another individual, the sick person would recover. Thomas began experiments in the 1950s, and found success with identical twins, although the marrow transfer didn't yet work with non-identical-twin individuals. Thomas then spent over a decade working in the lab—funded by federal grants—to "figure out the rules that allowed one to do transplants in an animal model," says Appelbaum. Thomas tried to determine how to match recipients' immune tissues—now known as human leukocyte antigen (HLA-matched)—as well as how to give just the right dose of radiation to destroy the abnormal marrow. He also studied ways to prevent recipients' bodies from rejecting the new marrow. 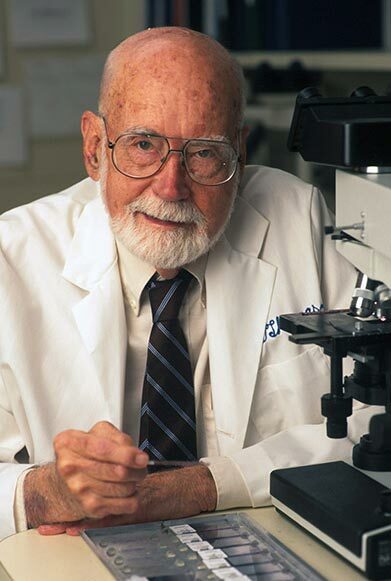 As Thomas was pioneering the use of radiation in the 1950s, George Santos, a Johns Hopkins University researcher, tried using chemotherapy drugs on mice to destroy diseased bone marrow without damaging the rest of the body. Santos' research on chemotherapy drugs as a safer alternative to radiation made headway for current bone marrow transplant procedures. In late 1960s, Thomas again embarked on a human trial of bone marrow transplantation. After securing a large National Cancer Institute (NCI) grant to form the Adult Leukemia Center at the Fred Hutchinson Center, he received another federal grant to form the first clinical transplant team—physicians, nurses, data managers, and laboratory techs. "That grant has been continuously funded to this day," says Appelbaum, who succeeded Thomas as principal investigator on the grant, which was renewed for $21 million in November 2012. The first bone marrow transplants began in the early 1970s, but early on, results were grim. "The vast majority of these patients had end-stage leukemia (cancer of the blood cells) and were very sick, and without the transplant literally only had weeks to live," Appelbaum says. Only about 15 percent survived. Those survivors, however, lived years later with no evidence of disease—and were, in fact, cured. "Previously, there was no cure whatsoever for these patients, so the fact that suddenly 15 percent were being cured was encouraging," Appelbaum says. Federal grants funded further experiments to develop better ways to prevent infection and graft-versus-host disease (GVHD), and to prepare patients for a transplant. Soon, survival rates steadily rose from 15 percent to 50 and 60 percent. Today, success depends on the disease that's being treated, the health of the patient, and the match level of the donor. Treating end-stage leukemia without a matched donor still yields low survival rates at 15 to 20 percent. But when treating aplastic or sickle cell anemia with a completely matched donor, survival rates rise to 90 percent. One of the first unrelated donor transplants took place in 1979 at the Fred Hutchinson Center, supported by federal funding. A young girl with leukemia had come in with no donor, and by reviewing the center's own pool of platelet donors, they found a lab tech who matched the girl and agreed to donate bone marrow. The transplant worked and the girl went into remission. "We suddenly realized that this was possible," Appelbaum says. The idea for a large national registry took root. The transplant community knew, however, that creating a large enough national unmatched-donor registry would require testing a large number of individuals. Creation of a national registry became imperative, given the seriousness of the problem: In 2010, more than 54COMMANUMBER000 U.S. people died of blood cancers, now the second leading cause of cancer-related death after lung cancer, according to the Fred Hutchinson Cancer Research Center. Only 8COMMANUMBER000 of those people received transplants. Additionally, in the mid-20th century, donor candidates were restricted to matched siblings—and the chance that a sibling is a match is only one in four. One way to extend the matches was to expand to an unrelated donor registry. With federal funding (from NCI, the National Heart, Lung, and Blood Institute, and the Department of Defense), the National Marrow Donor Program was created in 1986, operating its Be The Match Registry that connects patients with individual donors or transplant marrow. With an ever-growing database of some 10.5 million potential donors nationwide and 185COMMANUMBER000 umbilical cord blood units, the registry coordinates more than 5COMMANUMBER200 transplants annually. For the some 70 percent of people with a fatal blood disease who do not have a matched family donor, this registry saves lives. Internationally, some 20 million people worldwide have been HLA-typed to determine their bone marrow type and can serve as donors. Diversity, however, is still a challenge: While caucasians have a 60 percent chance of finding an unrelated donor, African Americans are underrepresented within the registry, with only a 20 percent chance of finding a donor. That's because there are more potential caucasian donors on the registry than African American donors. Additionally, African Americans have more genetic diversity than other races, meaning more diversity in HLA types. Still, more people are surviving: Researchers at the Fred Hutchinson Center compared 1COMMANUMBER400 Seattle transplant patients from 1993 to 1997 to another 1COMMANUMBER400 patients transplanted from 2003 to 2007, and found that fatalities due to transplant complications had been cut in one decade. In addition, the latter patients were older and sicker than the 1990s patients, meaning that advances in the field have become truly life-saving. In addition to matching patients with donors, the National Marrow Donor Program also collects detailed data on patient outcomes through the U.S. Department of Health and Human Services. Without government funding, such national data reporting and collection would be difficult to coordinate. From these data, doctors can better estimate outcomes for their patients' situations. "When your patient comes in for consultation, you can tell him/her what the expectations are," says Leo Luznik, physician-scientist and associate professor of oncology at the Johns Hopkins Kimmel Cancer Center. "So by having this national [data collection], not only can we provide better care, but we can provide accountable care because we can theoretically self-police ourselves and know how we we're doing." Researchers still have much to learn about successful transplants. First, they are figuring out how to do mismatched transplants and grafts using cord-blood transplants. Umbilical cords are filled with hematopoietic stem cells that tolerate more mismatching, according to Appelbaum. Other investigators using grants funded by NCI are figuring out how to expand stem cells into larger numbers for use in transplants—which will have real impact, particularly for ethnic minorities and children of mixed-race marriages. A second important research area involves implant safety and the prevention of disease recurrence. As they prepare the patient, doctors must immune-suppress the patient to get rid of as much of the abnormal cell population as possible without risking the patient's rejection of the graft. When Thomas first did this, he used total body irradiation—which was effective, but too toxic. Instead of entire-body irradiation, today's researchers are using monocodal antibodies or chemotherapy drugs to target abnormal cells so they can get better anti-tumor effects with much less toxicity. A third research area is preventing graft-versus-host disease (GVHD). A bone marrow transplant is actually a transplant of an immune system from the donor into a patient. Because the donor and recipient are not identical, the new immune system can sometime see the patient as "foreign" and will react by attacking the host's body cells. Graft-versus-host disease is the most common reason for death years after a transplant. "Without federal funding, we would not be able to address important, basic questions that are still unanswered," says Stefanie Sarantopoulos, a research physician at Duke University who has received federal grants to investigate the immune mechanisms underlying chronic GVHD. "That toxicity is very serious, and very common, and we don't understand the mechanisms very well [yet]." Even after more than 30 years of research, continues Sarantopoulos, it's been difficult to get any standard treatment for GVHD besides steroids, although National Institutes of Health has put millions into research on the issue. When it's not fatal, GVHD can cause significant patient suffering by affecting almost any organ or part of the body such as skin, esophagus, joints or liver, explains Sarantopoulos, whose research has focused on lesser-studied immune cells—B-cells—of which certain subsets may fuel the fire of chronic GVHD. "We're trying to develop agents that can get rid of rare 'bad' B-cells and allow the anti-microbial responses to continue," Sarantopoulos says. Other research that focuses on alternative methods of beating GVHD include Luznik's study at Johns Hopkins that found that giving patients high doses of a particular chemotherapy drug worked against GVHD both in fully matched and half-matched patients. More than 800 patients have been treated using this strategy at Hopkins alone. Through more federal funding, Luznik and other Hopkins researchers have recently learned even more about how this chemotherapy drug actually works. A fourth research area focuses on the desired graft-versus-leukemia effect. It works like this: In a transplant between non-identical siblings, the donor's immune system sees the patient's leukemia (or other disease) as foreign and rejects it—graft-versus-leukemia effect. In essence, the graft cells are helping the sick patient get rid of any remaining leukemia. Many researchers are trying to isolate T-cells—white blood cells that boost the immune system—responsible for this graft-versus-leukemia effect to try to encourage their growth despite graft-versus-host treatments. Current techniques (known as cellular immunotherapy) allow doctors to do just that, "and in fact we're getting such exciting results in that arena, that we may be able to just use those cells and not even have to do the transplant," Appelbaum says. Researchers must find a delicate balance between the prevention of GVHD and the promotion of anti-tumor effects. "It's like a pendulum: If you block one, you might block the other," says Luznik. "So we are trying to get better balance." "Every one of these questions and advances are the direct result of federally funded grants," says Appelbaum. Federal support is critical if researchers are to continue refining techniques and knowlege needed to improve patient outcomes. Government grants allow physician researchers to spend paid time in the lab, rather than relying on patient billing for their sole source of salary, explains Sarantopoulos, who says that a Department of Defense grant allowed her to pursue a leukemia research project that otherwise wouldn't have been funded. For patients and their families—both current and future—such research is the difference between life and death. "It's one thing to say you've halved the chance of dying after a transplant over the last decade," says Appelbaum, "it's another to actually see the patients that are cured and come back to you one year, five years, 10 years later. For them, it's the entire world."